Ji Young Anderson performs for Fairfield Warde high school on the balance beam during the 2011 FCIAC Gymnastics Championships at Westhill high school in Stamford on Saturday Feb. 12, 2011. 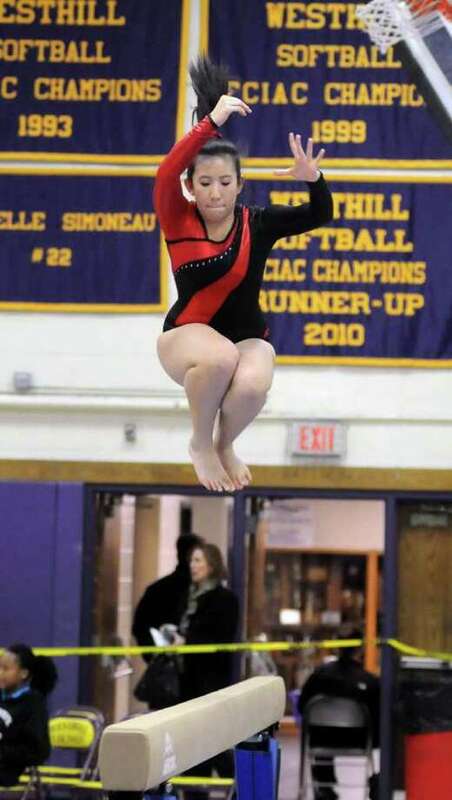 Moving on up was the theme for the Fairfield Ludlowe and Fairfield Warde gymnastics teams Saturday at the FCIAC championships at Westhill. Going into FCIACs, Ludlowe was seeded fifth and Warde sixth in the nine-team field but at the end of the day, the Falcons moved up to fourth with 119.85 points and the Mustangs (118.4) leaped into the middle spot, fifth. "It's always a great feeling to move up from where we were seeded," Ludlowe Coach Kim Longobucco said. "We took a big hit from last year but the kids stepped up and I was pleased." Warde Coach Darcey Appleby said, "They did very well. We peaked at the right time and did well on beam. A lot of the freshmen helped. It's always nice to move up a seed and leave a place higher." The top three teams maintained their seeds with Wilton (133.75) winning, Darien (132.8) taking second and Staples (121.8) placing third. Fourth-seeded Trumbull (116.55) dropped to sixth. In the name of full disclosure, Trumbull was missing one of, if not its top gymnast, senior co-captain McKenzie Collins. Ludlowe finished high on floor exercise by scoring 32.5 and placing second on it. The Falcons were third on the balance beam (28.9) and fourth on vault (32.9) but struggled on the uneven bars (25.5) and placed sixth on it. Warde was fourth on bars (26.75) and fifth on vault (32.65), floor (31.3) and beam (27.7). Falcon senior co-captain Sophie Tomeo had a memorable day by placing fifth in the all-around (32.7) category. "I think I did very well for myself and it was one of my best meets of the season," Tomeo said. "I'm happy with my performance and I've been practicing a lot." Tomeo was especially strong on bars (8.35) and took home the bronze medal in it. "I've been working extra hard on bars and I've been working on my form," Tomeo said. "I tried to do it as cleanly as I could." The senior also medaled on beam (7.7) by taking fourth and maintaining perfect balance. "I was excited to stay on beam the whole routine and I was consistent," Tomeo said. "It was a matter of staying focused and trying my hardest." On floor (8.35), Tomeo was tied for eighth and she was tied for ninth on vault (8.3). "I've been working hard on floor, especially on my jumps to make them big," Tomeo said. "My teammates cheered me on and I tried to do what I did in practice." Junior co-captain Dani Pasquarelli also had a good day for Ludlowe by placing eighth in the all-around (32.15) category. "I'm happy with how I competed, especially to place on vault and floor, which aren't my best events," Pasquarelli said. Pasquarelli medaled by placing sixth on floor (8.55) and tied for sixth on vault (8.45). "I had a lot of power and jumped high enough on vault," Pasquarelli said. "I knew I had to stick my tumbling passes on floor and I did my routine cleanly." Also competing all-around for the Falcons were freshman Annie Moeder (26.85) and sophomore Holy Eichrodt (26.45), who placed 20th and 21st respectively in the 77-girl field. Moeder excelled on vault (8.1) and floor (8.05). Sophomore Genevieve McNamara sparkled on vault (8.05) and junior Emma Sweet was solid on floor (7.55). "We did very good on beam," Kelly said. "I was very proud of everyone and pleased where we placed. I just tried my best." Freshmen Victoria Gallati (30.45) and Amy Nicholas (27.45) placed 14th and 19th, respectively, in the all-around for the Mustangs. Other Warde highlights include senior tri-captain Ali Kirsch on vault (8.0) and floor (7.9) and sophomores Sarah Zeisler (7.1 on beam) and Judy Thurston (6.1 on bars). Although the Mustangs qualified for States, they won't compete because most of their gymnasts will be away for February vacation. "I'm really proud of our team today," Warde senior tri-captain Emily Zeisler said. "We progressed throughout the season and peaked at FCIACs. I'm happy we got better each year." Kirsch said, "I'm really happy we had a fantastic beam day and this is our best season in my four years."